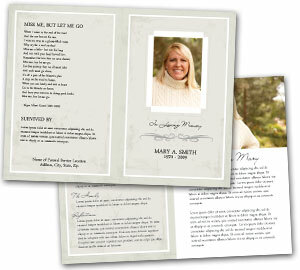 The following is a suggested structure for you to follow as a template for a funeral program service, that is both dignified and formal, yet simple. There is somewhat of a religious component to this service, (which can be increased or reduced), but the focus is on celebrating the life that was. Opening words, including the name of the person whose life we are honoring. Recognize and name the family or partners and their loss. 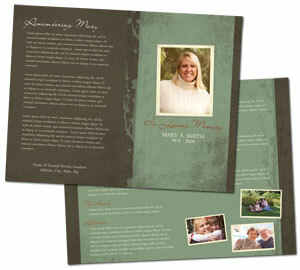 The person (or preferably two) leading the ceremony may introduce themselves; outline their role; give an idea of the length of the ceremony; invite people to sit down and encourage people to move forward if it is a sparse gathering in a large venue; indicate anything particular that will happen during or after the ceremony. Some action or gesture to mark the start of the ceremony, such as someone lights a candle or lantern near the coffin or urn or remembrance table. Listen to a piece of music such as a favorite song or hymn; readings of verse or favorite poetry with thoughts on the meaning and value of a life and the inevitability of death, chosen for their suitability to the person concerned (an old person dying at the end of a long and fulfilling life; a young adult killed in an accident; a child ...). The family may have suggested a favorite poem to be read. Everyone sings a secular song or a hymn together. To the life of (name of the deceased) given by friends, relatives, colleagues: Readings, stories, poems, or something a family member has written, to be read on their behalf. This can be an opportunity to quote from letters of condolence that have already come in. Invite people to stand; indicate it is time for the final part of the ceremony when we commit the body of (name of the Deceased) to its natural end. Offer a short silence for people's own thoughts or prayers. If this is a grave-side ceremony, the coffin is then lowered into the ground. A handful of earth, or flowers may be thrown into the grave. Focus people back onto their own lives, moving forward, carrying this sorrow and loss. Thanks on behalf of the family to those attending and for recent support given, where appropriate. Final piece of music to listen to, or to sing together. 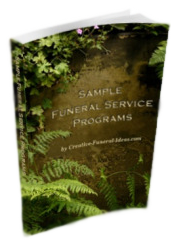 If you would like a downloadable copy of Several Sample Funeral Programs see our Sample Funeral Service Programs for more ideas. 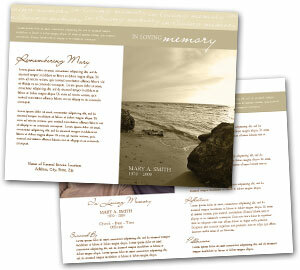 More help on planning a memorial service.